From left, Belpre Mayor Michael Lorentz, Mark Miller and Nancy Miller of Miller Prosthetics & Orthotics, their daughter Arienne Miller and office manager Susie Murphy at the grand opening of the business, 809 Farson St. Suite 108, on Dec 14. Keating stands in front. BELPRE – Family, friends and community members gathered on Dec. 14 to welcome Miller Prosthetics & Orthotics to the Belpre medical community. Belpre Mayor Michael Lorentz and the Belpre Chamber of Commerce brought out the golden scissors and marked the official opening of the company’s second office at 809 Farson St., Suite 108, at 4:30 p.m. that day. The party continued into the evening and guests were able to tour the new facility, and learn about the fabrication of artificial limbs and orthotics such as custom arch supports and ankle/foot orthotics along with custom knee, back and ankle bracing. Mark Miller has been a certified and licensed prosthetist and orthotist (CPO) in the Mid-Ohio Valley for the past 24 years. 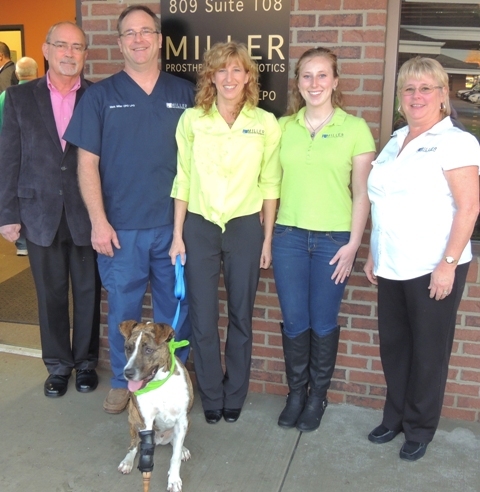 On Dec. 12, Mark and his wife, Nancy Miller, launched Miller Prosthetics & Orthotics, and opened their first office at 2601 Dudley Ave., Suite 5A, in Parkersburg in March 2013. As the business grew, the Millers decided a larger space was necessary to fabricate the custom prosthetics and orthotics in-house. The Millers said they were fortunate to find a rare opening in the Health Bridge building, which is now part of the growing medical complex on Farson Street in Belpre. The location is ideal for patients that are already visiting their doctor in the same complex, or those who may be coming from surrounding cities in Ohio such as Athens, Gallipolis or McConnelsville, the Millers said. The Millers, who are both originally from Ohio, joined the Belpre Chamber of Commerce, and again were delighted by the energetic greeting and continued introductions to area businesses and the surrounding medical community, they said. The Millers said they consider Karen Waller, executive director of the Chamber of Commerce, and the chamber as another extension of their team. The Millers have a deep sense of community pride and said they are thrilled to be doing business in their home state. Instead of moving the location to Ohio, the Millers felt it was important to keep the office in West Virginia open as well to better serve their patients. Patients now have their choice on which office they prefer to visit. Mark will continue to travel to each office, even as they build their team with additional clinicians, technicians and office staff, he said. At the open house, visitors were able to see and touch a variety of prosthetic legs, and learn a bit about how they are made and how they function. They learned how Mark scans the amputee’s residual limb into the computer using a laser scanner with reflective light technology. 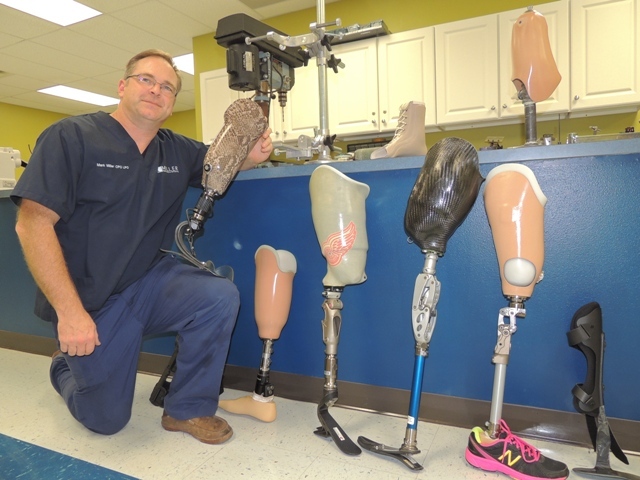 Mark Miller with some of the prostheses at Miller Prosthetics & Orthotics in Belpre. Mark then modifies the scan on the computer and is able to produce a socket that fits comfortably over the residual limb. The socket is then attached to a titanium pylon, along with knees, ankles and feet based on the patient’s desire and lifestyle. Sockets are often jazzed up with camo, tie-die, American Flag or other designs selected by the patient. Coverings that look like the original limb can be produced, but the latest trend is to show off their new bionics, the Millers said. Students who study bio-mechanical engineering are often interested in the design of prosthetic limbs and orthotics. The Millers’ Printrbot 3D printer was on display. The Millers plan to soon be using the printer for small items and hope to partner with the Ohio University Innovation Center 3D printing to perhaps expand into printing limbs and carts for pets. In August 2014, Mark and Nancy rescued a boxer mix puppy from Chattanooga, Tenn., who was missing part of his right front leg. Mark has continued to fit him with prosthetic limbs as he grows. Keating, the 1 -year-old puppy, was also at the open house, sporting his “pirate” leg for the party. Keating is a therapy dog in training, and can occasionally be found in either office or running around Belpre Civitan or Parkersburg City Park with Nancy. As their mission is to enhance the lives of amputees and others, they have started a prosthetic users group. The group meets on the fourth Thursday of the month at 6:30 p.m. at Shoney’s at 1120 Garfield Ave. in Parkersburg. All amputees and their family and friends are welcome to attend. Once the group is well established, the Millers hope it will be self-sustaining. Mark and Nancy have been selected to volunteer for the Paralympics in Rio de Janeiro, Brazil in September 2016. Mark is accepting new patients and is available for no-charge consultations, especially for new amputees struggling to adjust to their new challenges, the Millers said. He is available for in-services to educate area nurses, physical therapists and other caregivers on how to treat patients with limb loss. For more information go to MillerPO.com or call 740-421-4211.